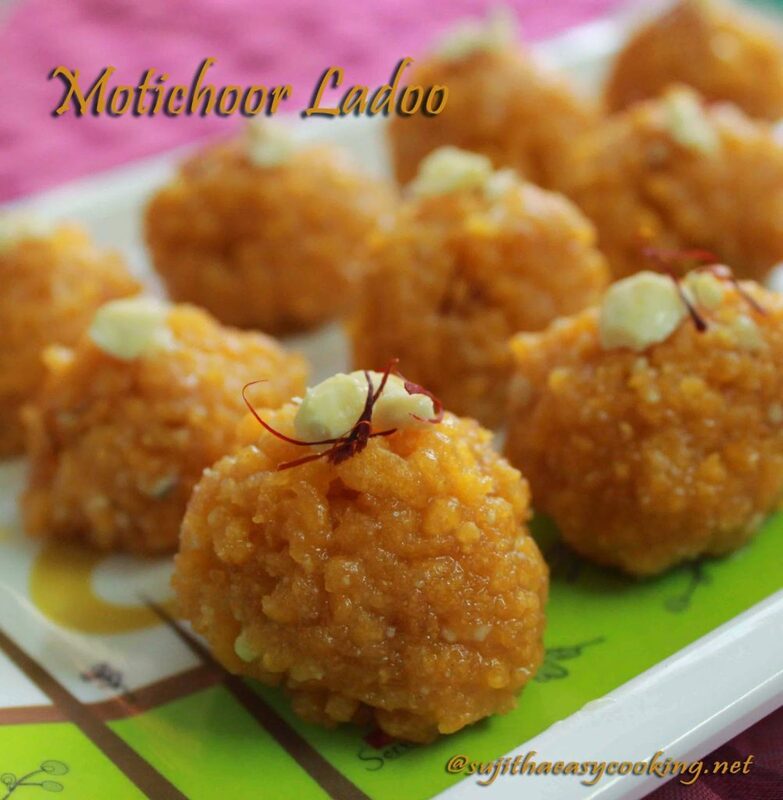 Motichoor Ladoo/Moti Choor Ladoo, one of the delicious Indian Sweets, festival seasons will never end without motichoor ladoo..
* Sieve besan flour, and sooji.. if need crush the sooji in mixer..
* Add a cup of water and mix the batter to dosa batter consistency, add the baking soda and food color to the batter, mix them well. 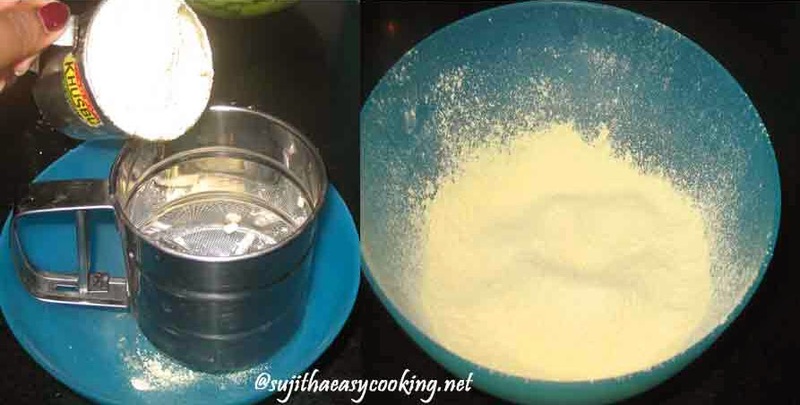 * Take the Sugar with saffron and cardamon in a pan, boil it till the sugar get dissolves, make the flame to simmer and boil it for 8-10mins till one string condition. *Check the sugar syrup, take the sugar syrup in your thumb finger and index finger it should form one string between the fingers.. keep the sugar syrup aside..
* Heat the Kadi with oil, use boodi plate or small holed ladle for this step, i used my holed ladle, drop the batter over the ladle and let the drop lets flow in hot oil.. take the boondhi’s immediately, dont allow them to cook till crisp, take them out when they softly cooked. 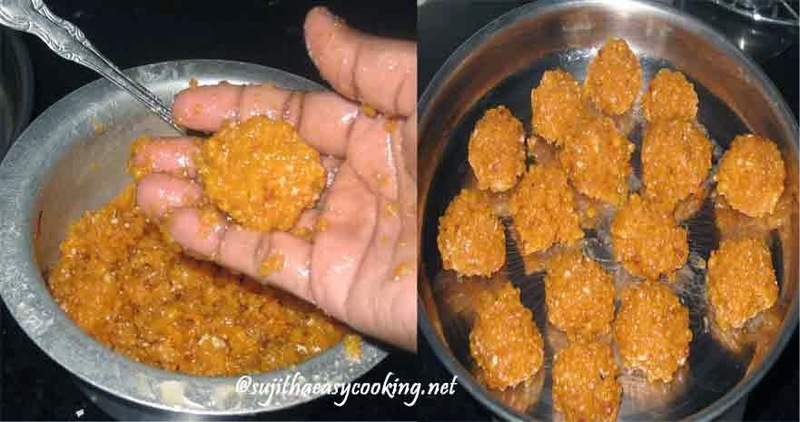 * Drain the boondi’s from oil and add them to the sugar syrup.. mix them well in the syrup. * Grind the Boondhi’s in the mixer with some cashews..
* Add Rose water to the mix, grease your hands with ghee and shape out the ladoos. * Make the batter to thin, not too thin the batter will run in the oil..
* Make the syrup to one string consistency, that’s very important. 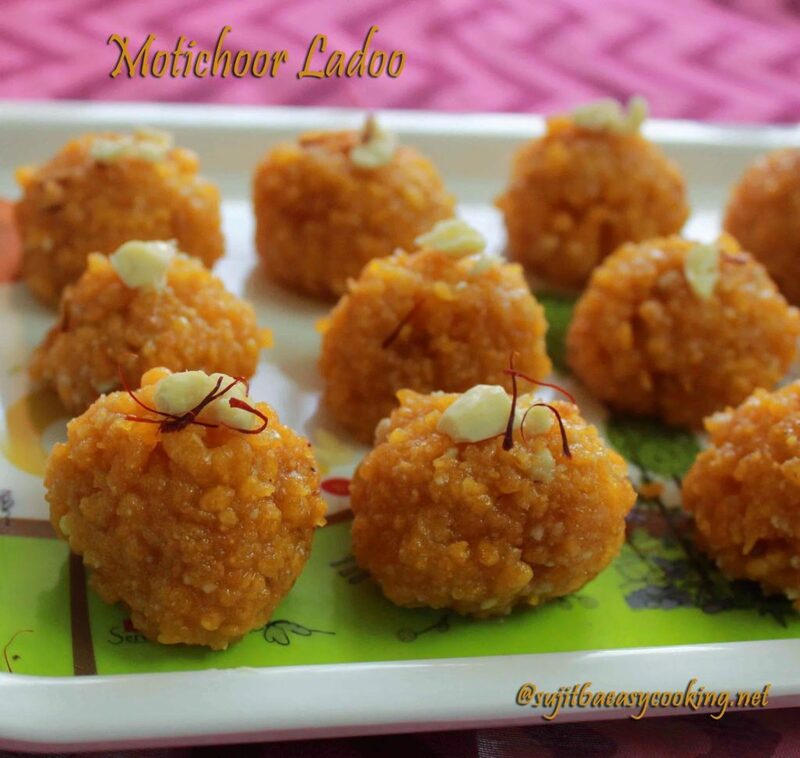 * Dont panic if the boondis didnt get ball shape, you are going to grind the boondi’s..
* Also don’t panic in when you shape the ladoo’s.. they’ll little lose after few mins they get set to the shape..
Top with Almonds and Saffron strings..
Looks so delicious… I remember my dad used to buy this every weekend when we were kids.